In opposition to results until now, poll finds a mere 4% separates preference for PM, gives Labor 25 versus 21 for Likud. 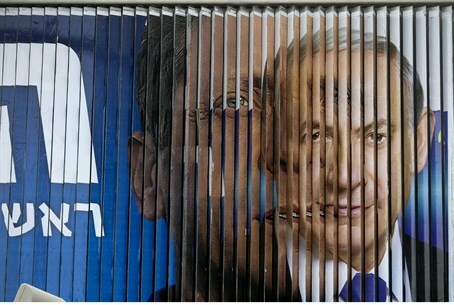 Herzog or Netanyahu - who will come out top on March 17? Constituting the fourth poll released on Friday, as elections frenzy closes in on the March 17 date for when Israel heads to the ballot box, a new survey by Reshet Bet shows the gap between who is seen as most fitting for prime minister is at the closest yet. Labor and Hatnua's "Zionist Union" continues to lead Likud as it has in the last several polls, showing results of 25 versus 21 mandates. The joint Arab list comes in next at 13, while Yesh Atid and Jewish Home tie at 11 apiece. Kulanu receives nine, as does Shas, and Yisrael Beytenu comes in at six, tying with United Torah Judaism. The far left Meretz party comes in at five, and the Yachad - Ha'am Itanu joint list with Otzma Yehudit continues to pass the threshold that was raised by the outgoing government with four seats. An unusual finding in the survey was that while previous polls have found a strong preference among voters for Likud head Binyamin Netanyahu to continue his role as prime minister as compared to Labor chair Yitzhak Herzog, the current poll shows the smallest edge yet for Netanyahu. A mere four percentiles separates the two, with Netanyahu being preferred by 45% and Herzog by 41%. Results in a TNS poll also released Friday showed completely different results that were more in keeping with results up till now, giving Netanyahu 48% as compared to just 28% for Herzog. Many have noted that there is a high level of unreliability in the polls, with calls heard for the polling process to be supervised.